Transmission line insulators perform two tasks. They electrically isolate transmission lines from the ground and they provide mechanical support to conductors. HV Engineers are involved in different types of insulator testing so as to ensure the reliability and proper working of power systems. Today you’ll learn about top 10 Insulator tests that are performed on transmission line insulators. These tests are classified into design, performance, and routine tests. The insulator is mounted in a working condition. An impulse voltage of 1/50 µsec is applied. Voltage is gradually increased to 50% of impulse flashover voltage. The polarity of impulse is reversed and again previous steps are repeated. 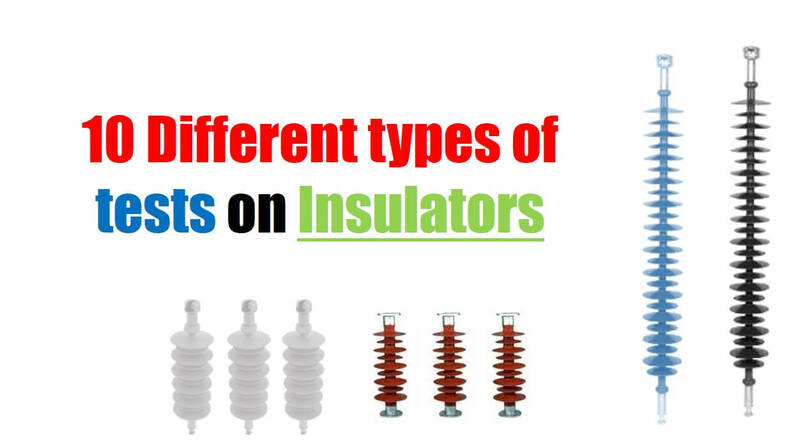 Insulator should be mounted just like practical working conditions. A standard wave of 1/50 µsec is applied. Repeat the test 5 times for each polarity. If insulator stays safe from flashover and punctures it is considered to be safe. Mount the insulator just like it is mounted in a practical environment. Gradually increase the voltage to a specific prescribed value. Maintain the voltage for one minute (Insulator should remain safe). Increase the voltage until flashover occurs. Repeat the step 4 for ten times (A well-designed insulator will not get damaged). Apply the prescribed rain voltage to the insulator and maintain it for one minute. Increase the voltage gradually till flashover occurs. Repeat the step 3 for ten times. A well-designed insulator should stay safe from punctures. Apply the specified voltage to the insulator. Wait for the specified time. There should be no visible corona on the insulator. Apply 2.5 times the maximum working tension for minute. Meanwhile, apply 75% of the dry flashover voltage. Insulator should stay safe without damage. Take a bathtub and fill it with normal water. Take other bathtubs and fill it with water having temperature 70° higher than normal. Immerse the insulator in hot water bath for X minutes. Repeat the step 2 and 3 five times. The insulator glaze should stay safe. Break down the insulator into small pieces. Immerse it in 0.5% alcoholic solution under pressure of 2000 lbf for 24 hours. Break the insulator into further pieces. There should be no impregnation. Apply 1/50 µsec impulse negative polarity voltage to insulator having amplitude 2 times of the 50% impulse flashover. Repeat the above for mentioned times. Repeat the steps for 2.5 times of impulse wave. Repeat the steps for 3 times, and then gradually increase to 3.5, 4, and so on until the insulator is punctured. The insulator should not puncture below the specified voltage. Suspend the insulator for one minute. Apply the 20% excess tensile load. The insulator should stay safe.